Be able to run, provision and stop a vagrant virtual machine. A virtual machine is a software implementation of a machine that executes programs like a physical machine. It essentially emulates a particular computer system. There are two main types of virtual machines, system virutal machines and process virtual machines. Multiple virtual machines can co-exist on the same primary hard drive. Can provide emulated hardware environments, different from the host instruction set. Less efficient that actual machine. A common example is the Java VIrtual Machine used for the Java Programming Language. 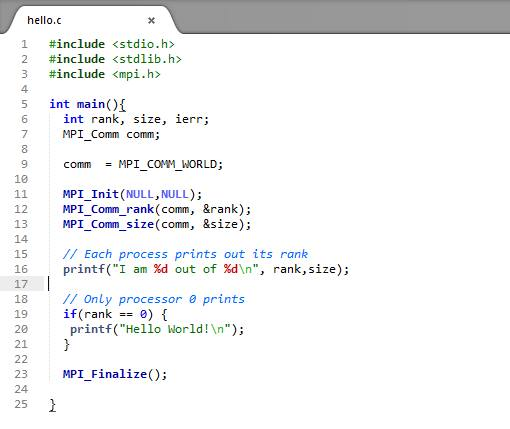 Another example is the .NET framework which runs on Common Language Runtime. Full virtualisation of the hardware can be achieved using either a type 1 or type 2 hypervisor. A type 1 hypervisor runs directly on the hardware and a type 2 hypervisor runs on another operating system e.g. linux. Some common hypervisors include Xen, KVM (used by Amazon Web Services), VMware and Virtualbox. Full optimisation is particularly in operating system development. It allows experimental code to be run at the same time as older more stable code, each in separate machines. Clusters of machines can aso be combined and access as a single virtual machine with shared memory. Here the virtualisation takes place on the operating system (kernel) layer. It can be thought of a slicing a single server into multiple small partitions called virtual environments (VEs). This approaches has very little overhead due to the lack of multiple kernels (they must use the same kernel) unlike KVM or XEN hypervisors. This is in itself also a limitations as all the VEs are limited to same kernel. Generally operating system level virtualisation can run a much higher density of VEs than fully virtualised hardware. Vagrant is software for easily creating and configuring virtual development environments. Essentially it is a wrapper around other virtualisation software such as Virtualbox, VMware and around configuration management software such as Ansible, Puppet, Chef and salt. It also supports Docker, which is an operating system level virtualisation. Today we will be using basic vagrant commands as well as puppet for setting up our virtual environment. Vagrant is configured using the Vagrantfile which contains information stored in plain text. A Vagrantfile can be used to configure a single machine or multiple machines. When vagrant commands are run, vagrant looks in it's current directory for a Vagrantfile. There must be only one Vagrantfile in a folder. Puppet is a configuration management tool for unix-like and windows systems. Essentially, the desired system configuration is placed in a manifest (a file written in Puppet's declaritive language). This manifest is then converted into a system of resources and dependencies that are used to configure the system. It makes it easy to install and setup software in an automated way. 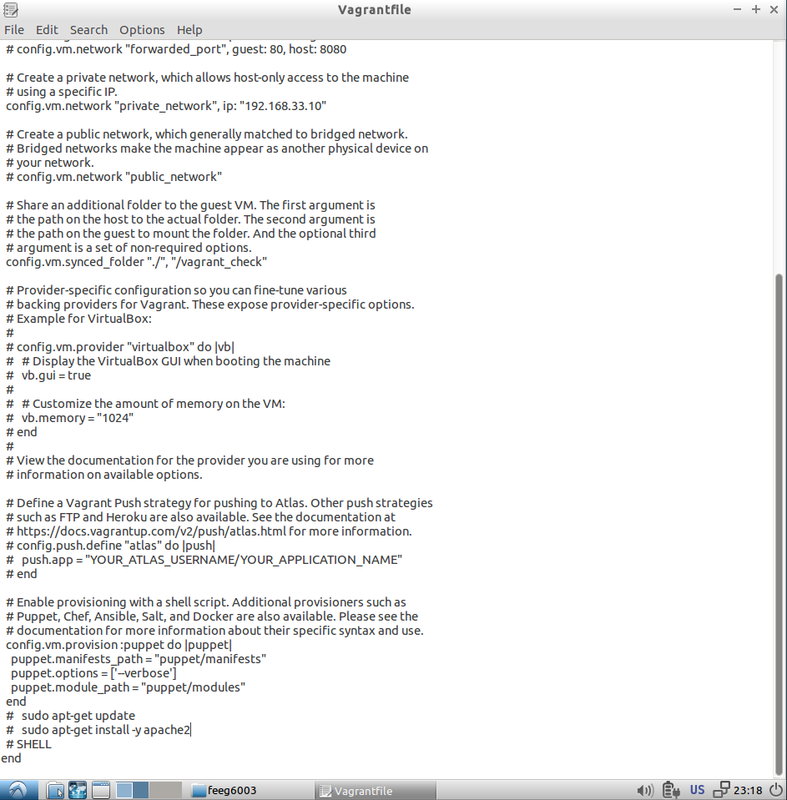 A manifest can be included in the Vagrantfile and used to configure the virtual machine, an example of this is shown further down. Go to vagrant website and download the appropriate install file for Windows or OSX. You can then proceed to install it like a standard program. Vagrant works on the basis of project folders. Each folder that you set-up vagrant in, starts a new project that is seperate from any other vagrant setups on the host machine. We have two boxes that we want to set-up today as part of this exercise. To begin with, we are setting up a 32bit Ubuntu box called 'hashicorp/precise32'. This is pulled from the default box provider in vagrant. This stage unpacks our downloaded box into the virtualisation software it was setup with and prepares it for launch. This is where vagrant gets very useful, using a provisioning system such as puppet we can automate tasks and commands to be run at the provisioning stage (when the machine is initially setup). This allows for the easy setup of multiple machines for testing purposes. There is a set folder structure that needs to be used with the puppet files in our project folder. To setup modules for puppet we need to create a folder in the puppet root folder named 'modules'. The structure for our modules are that the name of a folder created in 'modules' is the name of the module. There are many variables that can be changed in the Vagrantfile, however most of these settings are present by default and can be commented out to exclude. This makes it possible to ssh into the virtual machine in vagrant and for it to support your connection to the terminal. This gives us the vagrant project folder and a folder in it named 'vagrant_check' that are synced. For this first excercise, setup a virtual machine using the precise32 box employing all of the knowledge covered in this presentation so far. Write 2 puppet files to update the system and install gcc. 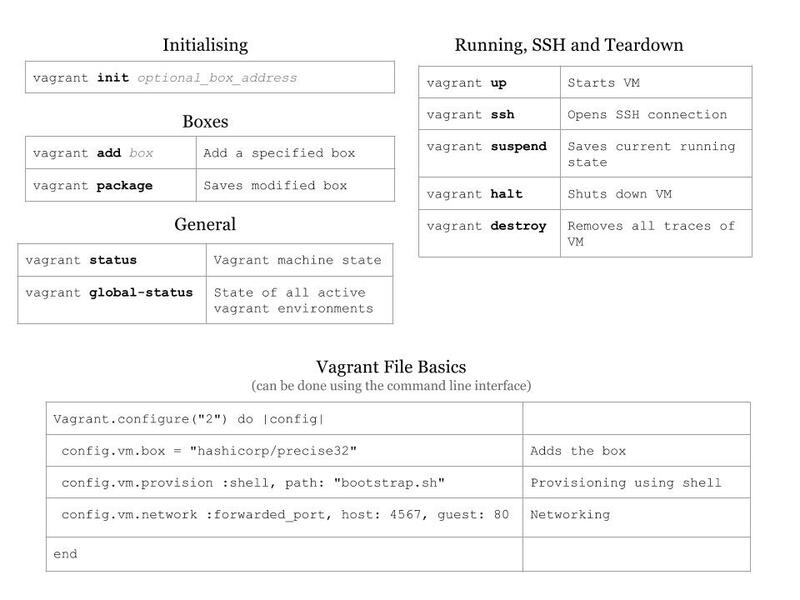 To setup multiple virtual machines in vagrant we need to add an additional box. This is done in the same way as the tutorial 1, except this time add the box 'chef/centos-6.5-i386'. Now we need to edit our Vagrantfile so that it will run both virtual machines and not just our original one. The first two lines of this will be commented out. to just run one of the virtual machines. to tell vagrant which one we want to connect to. A useful work-case for vagrant is that is allows you to remotely test your application on a personalised and specificly configured environment. This allows you to mimic an evironment you might want to deploy your finalised application on (a supercomputer for instance). 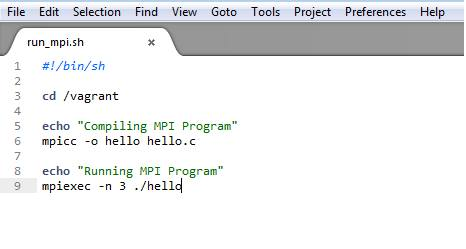 Here, we use a shell script provisioner to set-up our environment to run OpenMPI code. This creates a Vagrantfile where we can specify the provisioning instructions. Before we do this, we create the provisioning shell script. Next download the source code for builing OpenMPI using wget with the --no-check-certificate to stop it prompting you to confirm the connection. config.vm.provision :shell, :path => "provision.sh"
We are now ready to vagrant up. vagrant ssh -c "bash /vagrant/run_mpi.sh"